Menus is rated 5.0 out of 5 by 4. 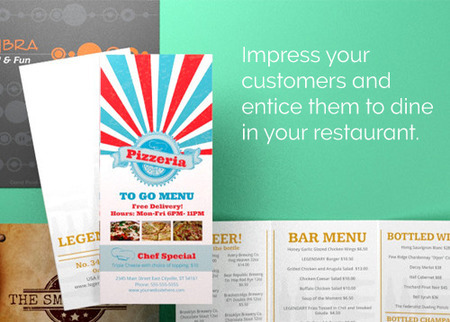 With our wide selection of menu printing options, PrintPlace.com has the answers for your takeout or dine-in menu. "Menus help promote the massage business to existing customers by giving them an item to keep in their home, maybe on their fridge that reminds them of the services that we offer… PrintPlace has made my advertising less stressful because they are so easy to price and order on the spot!" Rated 5 out of 5 by Sushi Mike from Menus came out beautifully Menus are very high quality. Folds are perfect. Colors came out stunningly. Rated 5 out of 5 by NFCC from Easy to read! working out great! customers happy and that works for me! Rated 5 out of 5 by Gillies Noodles from Great Quality on my Low Resolution Picture Excellent service and quality, plus fast turnaround time. The company makes sure you are updated on everything along the way. They fixed up my low-resolution file and our menus look great! A full-color, custom printed menu adds style and panache to any restaurant, bar, or cafe. A menu needs to be well-designed and beautifully laid out, not to mention professionally printed. Done right, they stimulate the appetite of customers to try a restaurant or to try highlighted specials. Select between 8 mailable sizes, including 5.5” x 8.5”, 11”x 8.5”, and 14” x 8.5”. Stock options include uncoated and gloss text, as well as uncoated and gloss thin and thick cardstocks. These options make it possible to make custom menus for anything from luxury menus for a five-star restaurant, a chic casual cafe menu, or a lightweight, mailable menu for takeout. Need it now? Select “same day printing”: Send your menus to press by Noon CT and we’ll print it the same day. For additional customizing options or questions, call us or submit our custom order form. Follow these specifications to ensure your artwork prints correctly. Our layout templates are provided as PDF, EPS, JPG, and Publisher files. Take advantage of our competitively priced direct mail services by mailing and printing takeout menus from the same location. Our direct mail services include processing of 1 mailing list, duplication removal if requested, CASS Certification, inkjet addressing, and postal presorting for automation rates. Whether you are printing a standard menu size or custom trimming your menus and plan to mail them, check our “Menu Mailing Requirements” for specifications. Does your restaurant have a particular theme or cuisine? Are you known for being the most romantic spot in town? Make sure your menus match the ambiance of your restaurant. Hiring good food photographers to bring your dishes to life will guarantee you more orders.Use our menu design templates and creating a menu that meets your vision is made simple. Menus aren’t just for dine-in patrons either. Consider if you need menus mailed or distributed door-to-door. This allows you to target specific geographic locations close to your restaurant. Going this route lets you market your restaurant, your food, and the ambiance, and start increasing foot traffic or calls for pickup and/or delivery. You don’t even need to create a new marketing piece.